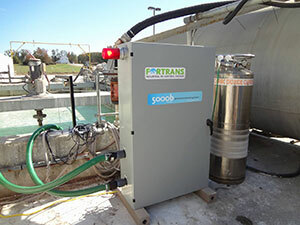 Fortrans Inc.® manufactures a self-contained pH control, neutralization, and monitoring system that uses CO2 gas to neutralize high-pH process water and lower total suspended solids in process water produced at ready-mix concrete plants. This system uses our patented Dif-Jet gas mixing device which dissolves over 90% of carbon dioxide gas into carbonic acid. The 5000B pH Control and Monitoring System for industrial process water from Fortrans offers proven technology to enable operators to control the pH and total suspended solids of process water in a cost-effective and easy manner. Over 600 of these CO2 pH neutralization and control systems are operating at concrete plants and other facilities throughout the United States. The pH control systems are easy to maintain, highly reliable, and affordable. Contact the industrial process water treatment professionals at 866-958-7267. We can partner with facility in the United States and Canada.